Back cover blur: The first body comes as a shock. The second brings horror. The third signals the beginning of a nightmare. When fifteen-year-old Isla Bell finds three bodies propped against Hadrian’s Wall, her whole world falls apart. In such a close-knit community, everyone knows the victims, and the man who did it. Twenty years on and Isla has dedicated her life to forensic psychology; studying the brains of serial killers, and even coming face to face with the convicted murderer who turned her world upside down. She is safe after all, with him behind bars. Then another body appears against the Wall. And another. As the nightmare returns and the body count rises, everyone in town is a suspect. Who is the Killer on the Wall? When Fifteen year old Isla Bell goes running alongside Hadrian's Wall first thing in the morning, every morning, it is to set her up for the day, to clear her head before school. One morning Isla's morning run is interrupted and her young innocence shattered with the discovery of Three bodies against the wall. A Fourth 'victim' is barely alive. The bodies have been placed to look as if they are merely resting against the wall, their hands clapsed together and placed in their laps, their heads lolling forwards on to their chests as if they were sleeping. Isla sees through her shock enough to realise that they are not breathing and she must get help. Help arrives swiftly in the form of her Police officer father, Eric Bell. The search for the perpetrator begins almost immediately, and when another potential victim goes missing, local man Heath McGowan is arrested. Twenty years later Isla is married to Ramsey, the sole survivor of the so called 'Killer On The Wall', who is supposedly safely in prison. Isla however, as a professor at the local university is about to come face to face with McGowan. Her aim in her work is to scan the brain activity of serial killers, murderers and assess and identify patterns as well as placing and scoring them on the 'psychopath chart'. Isla feels safe in her job knowing that these dangerous criminals are shackled to their prison guards at all times, and all objects that could feasibly used as a weapon are put out of reach. Her meeting with McGowan is nothing out of the ordinary. Has Heath instructed someone from the inside, is this a copycat killing, or a one off just to shake the local community. The local residents are fearful, as well they might be, for the truth lies much closer to home than any of them dared to believe. 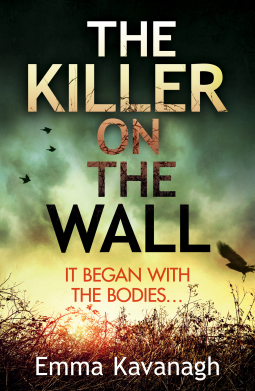 The Killer On The Wall is available now via Amazon online and all good book shops.